SOMEHOW, WE WERE ABLE TO TRACK DOWN EACH OF OUR VERY BUSY SCHOLARS TO ASK THEM EACH FIVE BURNING QUESTIONS ABOUT THE OPERA INDUSTRY, AND WHAT THIS YEAR ENTAILS FOR THEM. 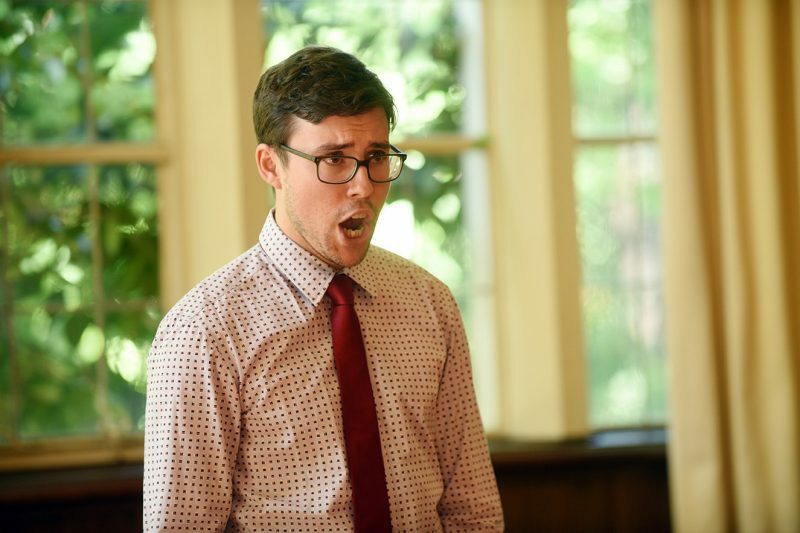 TODAY, WE CHAT WITH COUNTERTENOR, NICHOLAS TOLPUTT. You are a second time recipient of the John and Elizabeth Wright-Smith scholarship in 2016. Can you tell us a bit about how you’ve gotten to know John and Elizabeth? I remember my first gig for Melba fondly, because it was a celebration for John’s birthday at his home, and I’ve never been more nervous for a gig! I needn’t have been though, as John and Elizabeth are the most generous, supportive people and I couldn’t ask for kinder patrons. The Melba program has done so many wonderful things for me, but it’s been especially moving to meet John and Elizabeth, who have been there for me through all the successes over the past two years, sharing advice and encouragement. I’m indebted to them for their ongoing support. You just recently took out the top prize in the esteemed Sydney Eisteddfod Opera Scholarship AND the Australian Singing Competition – congratulations! Tell us about the experience of performing (and winning) at these prestigious awards.! I absolutely didn’t expect either one, and honestly, I wouldn’t have auditioned had it not been for [Melba Opera Trust Artistic Advisor] Sharolyn Kimmorley urging me to have a go. I didn’t think I was ready, but she encouraged me to take this first step. When I agreed to enter, I really did not see myself winning, but thought it was a great opportunity to see what I could get out of the experience. It is amazing to sing for adjudicators of that calibre, and you learn a lot about yourself as a singer. As the stages went by, I kept pinching myself because it was so surreal! And I guess that feeling was amplified when I won! Winning the competitions have already opened so many fantastic doors for me, but the gravity of it is just starting to sink in. What Is your favourite kind of repertoire to perform, and why? I think I’ve recently fallen in love with operatic repertoire, because sinking your teeth into a role is so rewarding. I enjoy oratorio and sacred music, but there’s something a little meatier about preparing a character. I love Handel – it’s bread and butter for countertenors – but there are so many composers in the Baroque era that I’m just starting to become familiar with! It’s really exciting at the moment because I feel like I’m discovering lots of new works, and everything is really thrilling. It was a dream come true to sing for Dr Erin Helyard in a recent Melba masterclass, because he is absolutely one of the world’s leading experts when it comes to Baroque repertoire. To be able to pick his brain about baroque style and ornamentation was fantastic, and his approach was really refreshing and engaging. I found him very inspirational. As a former University of Melbourne student, what has the transition between university life and professional singing been like? It’s been really challenging, but I think that transition is hard for every singer. Bridging the gap between uni and professional life is an aspect that being part of Melba has really helped with, through the support and the networks you receive as a scholar. There’s a family of singers who have gone through the program before you, who are familiar with the demands and the stress of being new to professional life, and they’re absolutely happy to give you advice. For me personally, confidence has been something I’ve struggled with, and while some singers get out of bed in the morning and know with absolute certainty what they’re going to do and how they’re going to do it, a lot of us have huge doubts, and I’ve definitely wondered if I was doing the right thing, or if I was on the right path, but in those moments Melba really helps. That support has really made it clear that this is what I want – and hopefully I am on the right course!! Right now you go between Melbourne and Sydney for performances, and you grew up in Tasmania! How does the operatic culture change between these three places, and where is your favourite place to spend time in each of them? It’s interesting actually, when I was living and studying in Melbourne I kept my head down and was really dedicated to studying during my course at Melbourne Conservatorium, and as a consequence, no one knew I was there! Since getting a Melba scholarship and moving to Sydney though, most of my engagements have been in Melbourne, or in Queensland, which has been fantastic. Melbourne and Sydney are really different in terms of the opera scene, but I don’t think one is better than the other. Sydney has the Opera House, and is a bit of a hub, but Melbourne does some really exciting things. I’ve been lucky that Melba has opened opportunities everywhere. Singing at home in Tasmania is the most nerve-wracking thing though – I think performing for family and friends is the hardest! It’s always good to go home though. Congratulations to our scholars and alumni! When you are awarded a scholarship with Melba Opera Trust you enter a year-long ‘finishing school’ to reach your operatic potential. We have a saying – “once a Melba, always a Melba”. We invite you to join our community and support the future of Australian opera singers and repetiteurs. © Copyright 2016 Melba Opera Trust | Website by Charles Lin Design.